Talking with Charleston-based artist Tate Nation feels a lot like chatting with a friend. Discussions can veer from running (he’s had major knee surgery and is not currently supposed to run), to snowy winters spent in upstate New York (he came south seeking warmer climes), to the ins and outs of swimming freestyle (he was an NCAA collegiate athlete). But despite his easy, laid back demeanor, it’s clear: Tate Nation is a hard-core professional artist, in Charleston to stay. When we spoke, Nation was on Day 3 of the 17-day Piccolo Spoleto Art Show in Marion Square. His tent – possibly bigger than his King Street gallery space – was crammed full of color: acrylic pieces on wood in bright hues with almost a Keith Haring feel. The day was hot and muggy, although what late-May day in Charleston isn’t hot and muggy? 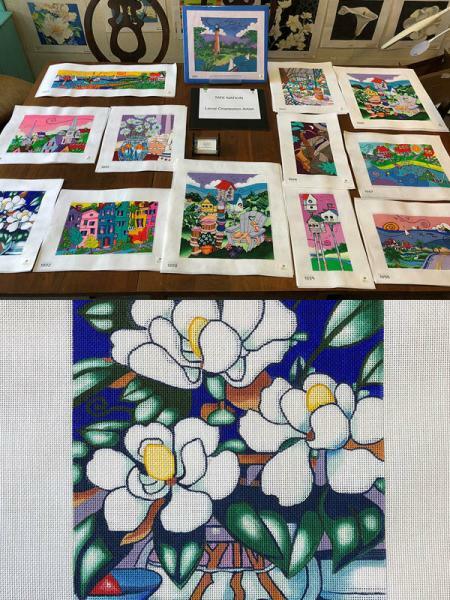 Days at the art show begin around 10, and carry on past dark, and barring bad weather, artists are expected to be present the whole time, representing their work to the throngs of Spoleto art aficionados. Casual talk for an artist who’s been in the business for decades, and who’s painted commissions for the United States Postal Service, Coca Cola, and Delta Airlines, to name a few. 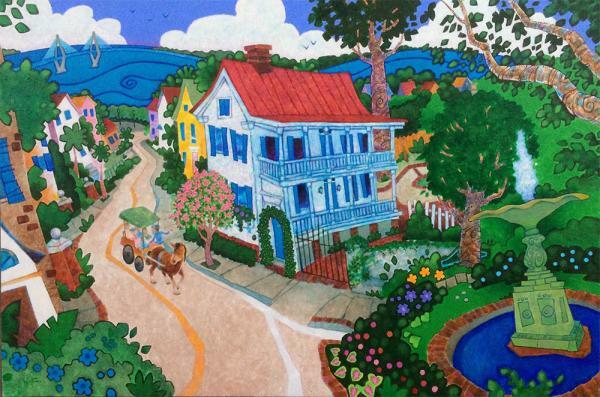 He was juried into the Piccolo Spoleto Art Show 17 years ago, and has appeared there ever since. 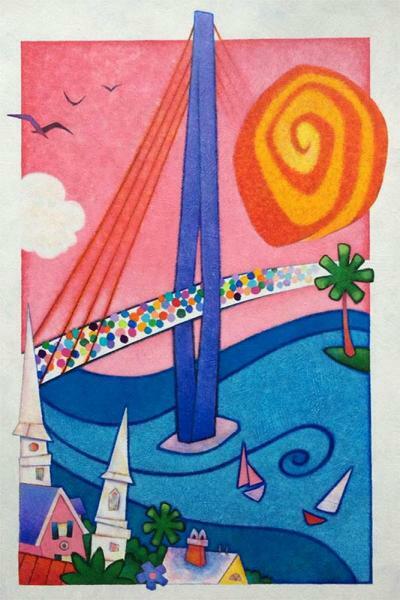 In 2016, he entered the Cooper River Bridge poster artwork contest for the first time…and won. 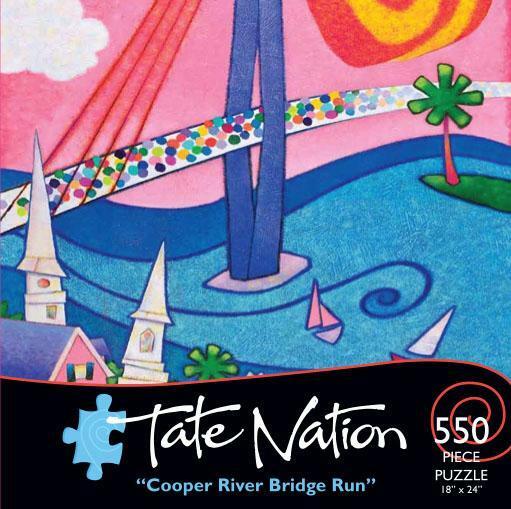 Thus, Nation’s art was displayed around the Lowcountry on posters honoring the 40th anniversary of the Cooper River Bridge Run. These are no small fetes, one must admit, but show the pedigree of an artist perhaps at his prime. Nation’s career began in conventional waters. 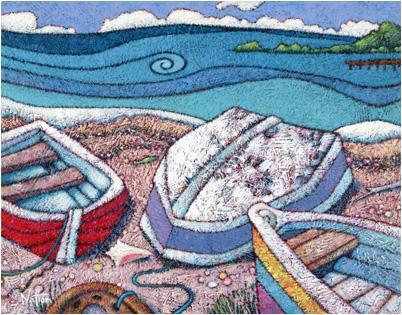 Always interested in art, he began working for a screen-printing company after college. That lead to a career in freelance graphic design and book illustration (for a local example of this, check out his illustrations in Yo Millard Fillmore! (And All Those Other Presidents You Don’t Know) by Charleston-based writer Will Cleveland). 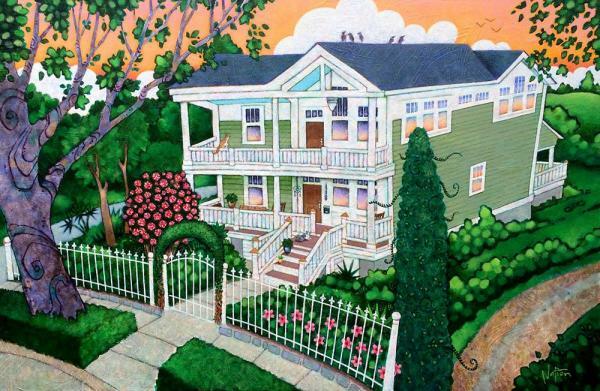 But after 15 years of illustration, the gallery life called him home. Soon he began fine-tuning his style, which doesn’t have a name but is 100% Tate Nation. “I’d recognize your stuff anywhere,” a friend told him recently, making Nation’s day. 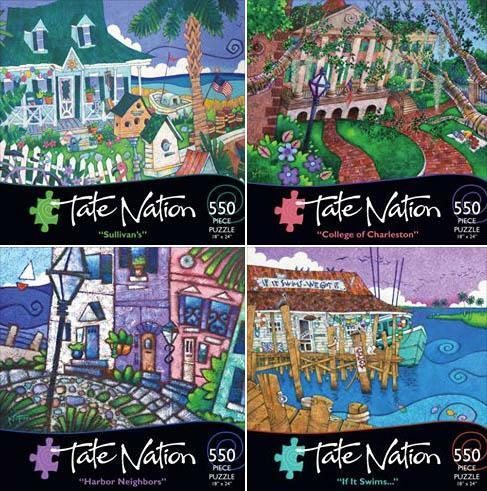 The Tate Nation style is heavy on beachy, Caribbean influences, and is chock-full of Charleston too. Sweetgrass baskets, Society Street – downtown Charleston holds sway in many of Nation’s pieces. 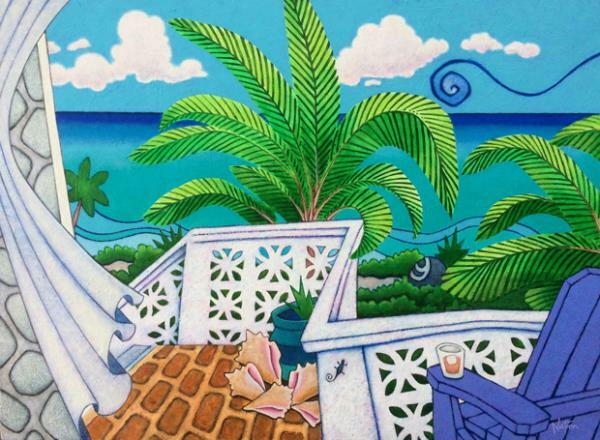 “I paint from my imagination,” Nation says. He starts with a sketch to nail down the composition. “Getting the composition right is everything to me.” It tends to morph as he goes, adding a bicycle here, a streetlight there. Then he layers on the paint. Flipping through his phone, he shows off the life cycle of a recent painting – a sketch of some irises, a layer of deep blue paint, a chalk rendering, and then lots more layers of color, creating a painting reminiscent of Van Gogh but still entirely…Tate Nation. Considering the price tag - the awards and accolades of an artist in his prime - and a style that’s all Tate Nation, it’s safe to say…they do. 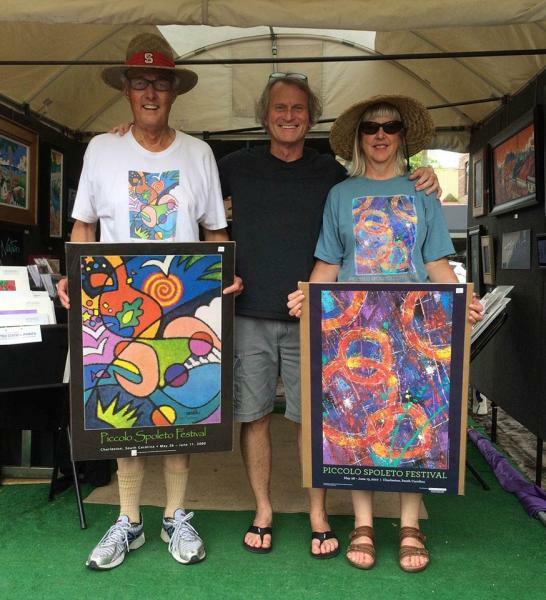 This couple from Georgia came in to my Piccolo Spoleto art exhibit tent in Marion Square, wearing t'shirts from the two years that my paintings were chosen as the official image for the Festival (2000 and 2010)! How cool is that?!? This commission was a truly Special Honor! I was privileged to be commissioned by renowned Charleston artist Betty Anglin Smith's husband, Cody, to paint this as his surprise gift to Betty for their 50th Wedding Anniversary! 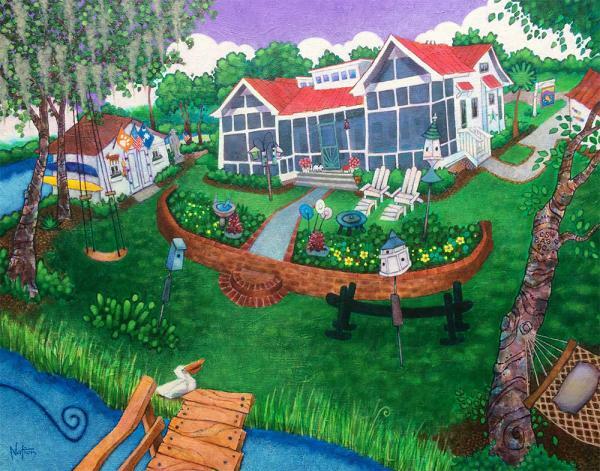 It's of their beautiful 100 year old marsh house in Meggett, SC, where Betty paints and they spend much family time! Happy Anniversary Cody and Betty, and thank you for allowing me this honor! COOPER RIVER BRIDGE RUN 2017... Official Artist of the 40th Annual Bridge Run! BIG Exciting NEWS around my studio!! My Painting "the Big 4-0" was recently chosen as the Winning Artwork for the 40th Annual Cooper River Bridge Run, the third largest 10K and fifth largest road race in the United States! For the April 1, 2017 race, my painting will be featured on 50,000 t'shirts, thousands of posters, and untold amounts of race gear, promotional schwag, awards, and prizes. To say that I'm honored would be a huge understatement. Sign up for the race and you'll receive some of those goodies! I hope to see you in Charleston for the run, or at any of the 40 days & 40 nights of events leading up to Race Day! Commissioned by the couple who recently restored this 1840 house near the Charleston Museum and Fountain Park. Commissioned by a gentleman in Madrid, Spain as a surprise gift to his wife, to commemorate the 10th Anniversary of their wedding in Charleston. A 75th Birthday surprise for a gentleman, commissioned by his daughter & wife. A surprise Anniversary gift, commissioned by a good friend for her husband, a long-time good friend of mine! A family's new home (including their 2 cats! ), downtown near Hampton Park. 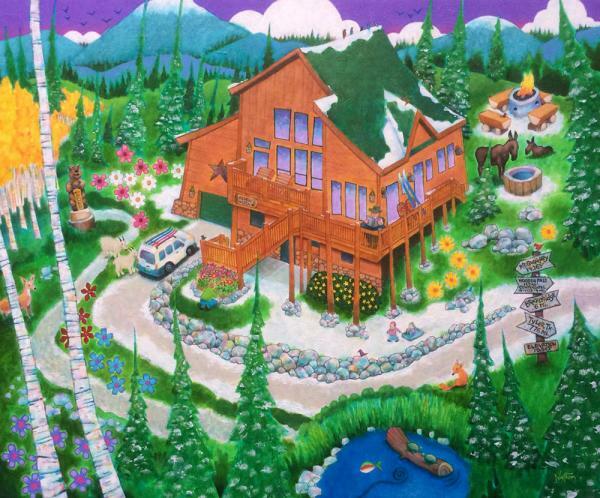 A Texas couple's vacation home in Colorado, commissioned by the wife, as a surprise gift for her husband. 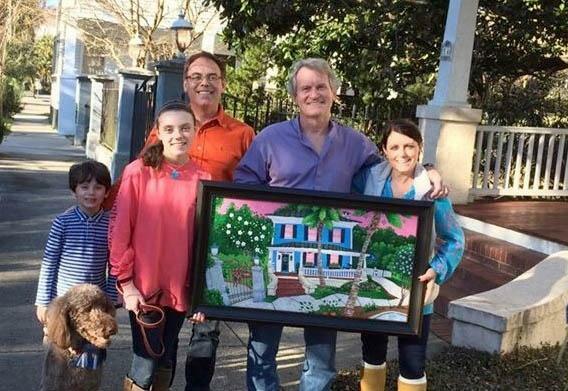 Recently, I had the tremendous pleasure and privilege of delivering this house portrait to my long-time dear friend, Lee Helmer, that his wife, Lynn, commissioned me to create as a surprise gift for their anniversary! 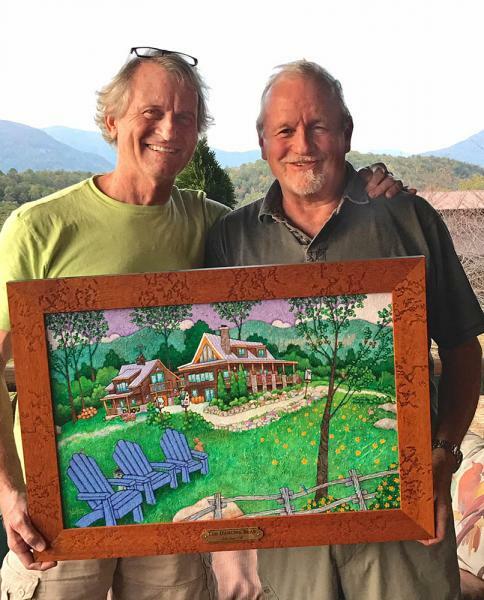 It's a painting of their beautiful Lake Lure, NC mountain house ("the Dancing Bear Lodge"), jam-packed with lots of personal details and love. To say that Lee was stunned by Lynn's surprise would be a huge understatement! I was incredibly honored to have played a role in their anniversary surprise. New Puzzles Are Now Available!! 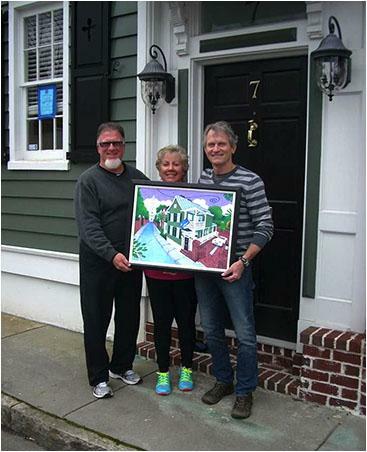 The Stieber Family is thrilled with their new house portrait! ... and so am I! 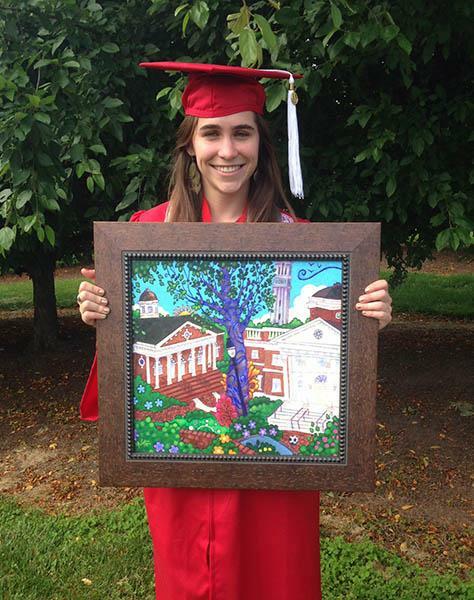 A special graduation gift for a recent NC State University graduate! This recent graduate's mother commissioned me to paint some of her favorite spots on campus, and presented her with it immediately after graduation ceremonies! Nice gift from a proud mom! 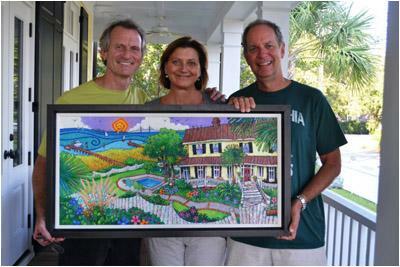 New House Portrait - Very Happy Customers! 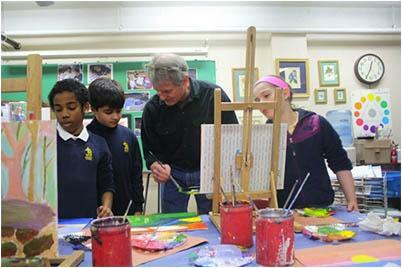 I had an awesome week in BOSTON last month as ARTIST-IN-RESIDENCE at the Jackson School! While there, I conducted painting workshops with some incredibly creative & talented 4th, 5th, & 6th grade artists, and had so much fun showing & discussing some of the kids' books I've illustrated with grades k-3. ... Can't wait to go back again! 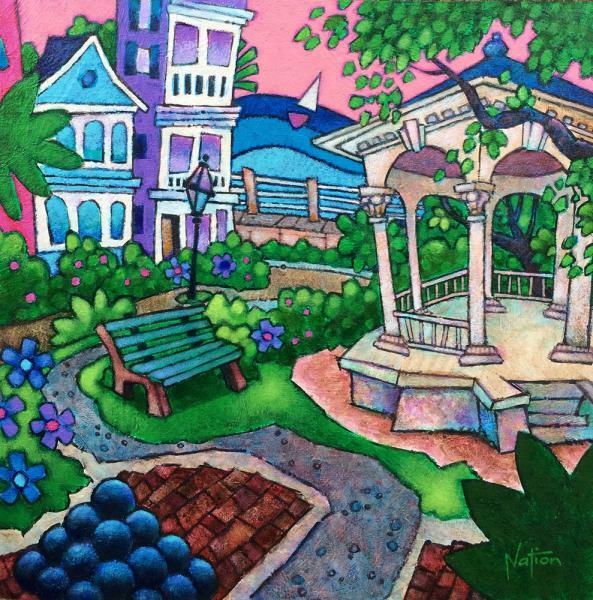 I'm honored to have been commissioned by CAROLINA ONE REAL ESTATE to paint a custom iconic Charleston scene in celebration of their 50th Anniversary... At their grand gala & awards ceremony, my original painting was unveiled, and each of the hundreds of attendees was given a commemorative print! NEW! 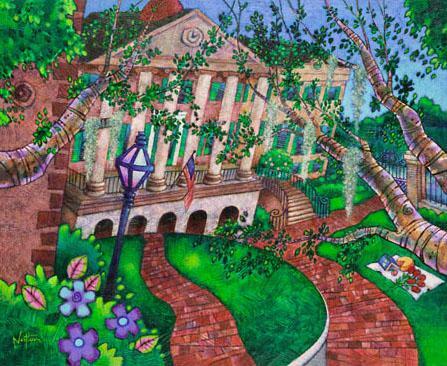 "College of Charleston" limited edition prints, available in two sizes! A perfect gift for students, recent graduates, or alumni! Start your Thanksgiving morning off right with a fun 5k run along with 6,000 of your closest buddies, and get a great-looking shirt to prove you did it! See you there. 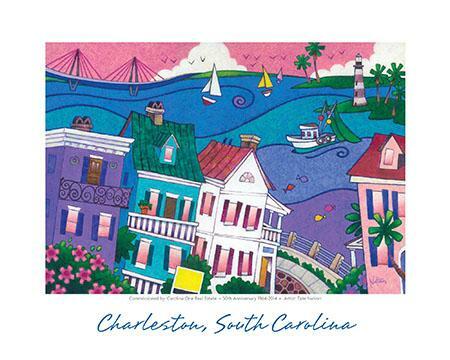 My painting, "On the Harbor" was selected as the official poster & t-shirt image for the 2011 Turkey Day 5k Run in Charleston. Watch the video interview! 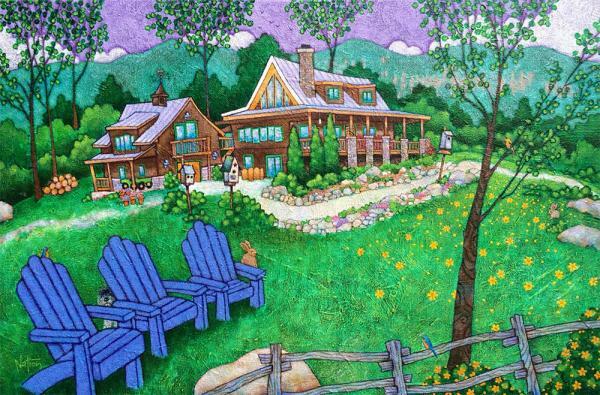 Just delivered this new house portrait commission to a very excited Brad Creger and Louisa Shingler in Mt. Pleasant! Before I begin a house portrait painting, I visit with the client in their home and talk with them at length, finding out the things that make their home so special to them. I take scores (sometimes hundreds!) of photos, from all angles, from both close-up and far off, and of every possible detail, so that as I paint I can incorporate numerous personal details to help capture the home's character. If you'd like to discuss commissioning me for a house portrait or another private work, please contact me. 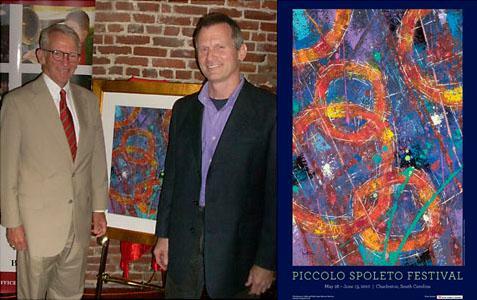 At a May, 2010 press conference with Charleston mayor Joe Riley and officials from the Piccolo Spoleto Festival,one of my abstract paintings, "Connections", was unveiled and introduced as the Official Poster Image for the 2010 Piccolo Spoleto Festival! "Connections" was featured on thousands of posters and t'shirts throughout the Festival, as well as on the covers of tens of thousands of program guides! By the way, having previously been featured as the Festival's Official Poster Artist in 2000, I'm now a member of an elite group of only 3 or 4 artists to have ever been honored as a repeat winner in the Festival's 32 year history! The Mt. 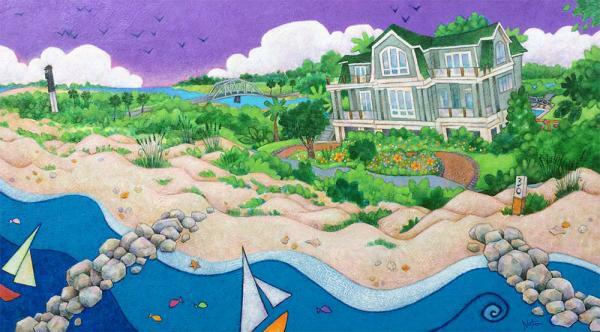 Pleasant (SC) Recreation Department recently cut the ribbon on its brand new Senior Recreation Center, complete with seven large framed canvas giclee prints that the town commissioned me to reproduce from some of my favorite paintings. I’m honored that they chose to feature ONLY my artwork throughout the Center, so it’s kind of a private gallery, and I’ve received many nice comments from their patrons. If you’re in Mt. Pleasant, please stop by and see this beautiful facility!